Large Format Posters is rated 4.8 out of 5 by 15. Rated 5 out of 5 by TDoc from outstanding job! love the thicker paper. prints were done quick, very professional, look very nice. Shipping was a piece of cake. Thank you. Rated 5 out of 5 by rbradwaynrm from Great posters Frankly I was not sure what I was going to get for a 2x3 foot poster at $13 a piece. I was amazed. Beautiful. Rated 4 out of 5 by Jj printer from Ok, but could be cheaper Ok experience. Some time to deal with format. Could be cheaper. When it comes to major announcements like a store opening or establishing your brand at a trade show, you need a large poster board that consumers will immediately notice. Large format poster printing instantly captivates and sustains your customer’s attention with its high-resolution quality and vivid colors. 24" x 36" is a popular choice for large posters announcing a major sale, a new store branch, and other big deals outdoors. 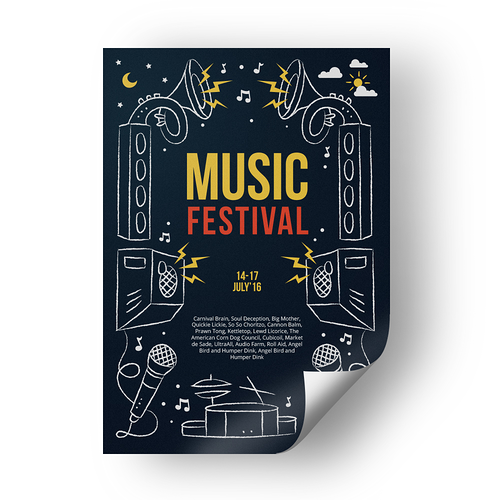 18" x 24" is a standard medium size for advertorials, campaign collateral, movie promotions, and other marketing materials seen in both indoor and outdoor settings. 16" x 20" is a common choice for artwork, photos, or other decorative images displayed on walls. All posters are printed on high-quality photo paper that ensures a crisp, clear finish to your design. Choose from two gloss finishes that bring every color to life. Only the front side is printed on for this product. This keeps your customer’s attention on the details and allows you to display the poster in different ways. Have your large format poster printing done with us today and the order will be ready after 1 business day. Upload a file online or use one of our templates to ensure a print ready design. Yes, you can order a size that isn’t offered in our standard choices on our Custom Quote page. Select large format posters from the choices then type in your preferred size. We also offer other customizable options for the paper stock, lamination, and quantities. Is there a minimum quantity for ordering large format posters? No, we do not require a minimum quantity for large format posters. You can order 1, 2, and up to 50 large format posters. What is the fastest turnaround for a large format poster order? Posters can be ready after 1 business day, which means you only wait 48 hours for a one-day printing turnaround. “Printing turnaround” is the number of days spent producing your order. Orders with a PDF proof will be shipped after you have approved the file. Select the “Estimate Delivery Date and Shipping Cost” to know when your order will arrive.